Animals constantly modify their behavior through experience. Flexible behavior is key to our ability to adapt to the ever-changing environment. My laboratory is interested in studying the activity of neuronal ensembles in behaving animals, and how it changes with learning. 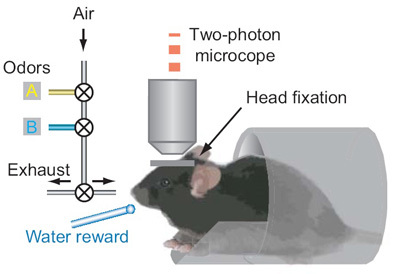 We have recently set up a paradigm where mice learn to associate sensory information (two different odors) to motor outputs (lick vs no-lick) under head-fixation. We combined this with two-photon calcium imaging, which can monitor the activity of a microcircuit of many tens of neurons simultaneously from a small area of the brain. Imaging the motor cortex during the learning of this task revealed neurons with diverse task-related response types. Intriguingly, different response types were spatially intermingled; even immediately adjacent neurons often had very different response types. As the mouse learned the task under the microscope, the activity coupling of neurons with similar response types specifically increased, even though they are intermingled with neurons with dissimilar response types. This suggests that intermingled subnetworks of functionally-related neurons form in a learning-related way, an observation that became possible with our cutting-edge technique combining imaging and behavior. We are working to extend this study. How plastic are neuronal microcircuits during other forms of learning? How plastic are they in other parts of the brain? What are the cellular and molecular mechanisms of the microcircuit plasticity? Are the observed activity and plasticity required for learning? 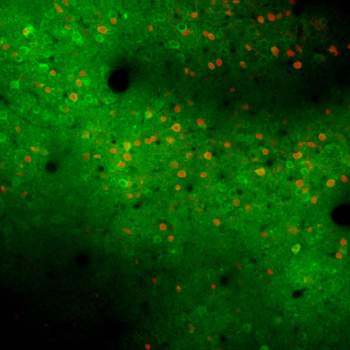 How does the activity of identified individual neurons change over days to weeks? We are asking these questions, combining a variety of techniques including in vivo two-photon imaging, optogenetics, electrophysiology, genetics and behavior. Lu, Y., Liu, X., Hattori, R., Ren, C., Komiyama, T., and Kuzum, D. (2018) "Ultra-low Impedance Graphene Microelectrodes with High Optical Transparency for Simultaneous Deep 2-photon Imaging in Transgenic Mice." Advanced Functional Materials, 1800002. DOI: 10.1002/adfm.201800002. Mitani, A., Dong, M. and Komiyama, T. (2018) "Brain-computer interface with inhibitory neurons reveals subtype-specific strategies." Current Biology, 28(1), 77-83. Chu, M.W., Li, W.L. and Komiyama, T. (2017) “Lack of pattern separation in sensory inputs to the olfactory bulb during perceptual learning.” eNeuro*, *0287-17.201. Hwang, E.J. *, Dahlen, J.E. *, Mukundan, M. and Komiyama, T. (2017) “History-dependent action selection bias in the posterior parietal cortex.” Nature Communications*,* 8, 1242. Hattori, R.*, Kuchibhotla, K.*, Froemke, R.#, and Komiyama, T.#(2017) Functions and dysfunctions of neocortical inhibitory neuron subtypes. (Review) Nature Neuroscience , 20, 1199-1208. Makino, H.*#, Ren, C.*, Liu, H.*, Kim, A.N., Kondapaneni, N., Liu, X., Kuzum, D. and *Komiyama, T.#*(2017) Transformation of cortex-wide emergent properties during motor learning. *Neuron*, 94(4), 880-90. - *Preview* by Banerjee and Long, *Neuron* 94(4), 698-700. McIntyre, J.C., Thiebaud, N., McGann, J.P., *Komiyama, T.* and Rothermel, M. (2017) Neuromodulation in chemosensory systems. (Review) *Chemical Senses*, 42(5), 375-9. Makino, H.*, Hwang, E.J. *, Hedrick, N.G. * and Komiyama, T. (2016) “Circuit mechanisms of sensorimotor learning.” (Review) Neuron, 92(4), 705-21. Chu, M.W., Li, W.L. and Komiyama, T. (2016) “Balancing the robustness and efficiency of odor representations during learning.” Neuron, 92(1), 174-86. Makino, H. and Komiyama, T. (2015) “Learning enhances the relative impact of top-down processing in the visual cortex.” Nature Neuroscience, 18(8), 1116-22. Chen, S.X., Kim, A.N., Peters, A.J. and Komiyama, T. (2015) “Subtype-specific plasticity of inhibitory circuits during motor learning.” Nature Neuroscience, 18(8), 1109-15. Boyd, A., Kato, H.K., Komiyama, T. and Isaacson, J.S. (2015) "Broadcasting of cortical activity to the olfactory bulb." Cell Reports, 10(7), 1032-9. Peters, A.J., Chen, S.X. and Komiyama, T. (2014) Emergence of Reproducible Spatiotemporal Activity During Motor Learning. Nature, online. Guo ZV, Hires SA, Li N, O'Connor DH, Komiyama T, Ophir E, Huber D, Bonardi C, Morandell K, Gutnisky D, Peron S, Xu NL, Cox J, Svoboda K. (2014) Procedures for behavioral experiments in head-fixed mice. PLoS One, 9(2):e88678. Kato, H.K., Gillet, S.N, Peters, A.J., Isaacson, J.S. and Komiyama, T. (2013) Parvalbumin-Expressing Interneurons Linearly Control Olfactory Bulb Output. Neuron, 80(5), 1218-31. Kato, H.K. *, Chu, M.W. *, Isaacson, J.S. and Komiyama, T. (2012) Dynamic Sensory Representations in the Olfactory Bulb: Modulation by Wakefulness and Experience. Neuron, 76(5), 962-975. Sweeney LB, Chou YH, Wu Z, Joo W, Komiyama T, Potter CJ, Kolodkin AL, Garcia KC, Luo L. (2011) Secreted semaphorins from degenerating larval ORN axons direct adult projection neuron dendrite targeting. Neuron, 72(5), 734-47. O'Connor, D.H., Clack, N.G., Huber, D., Komiyama, T., Myers, E.W. and Svoboda, K. (2010) Vibrissa-based object localization in head-fixed mice. J. Neuroscience, 30, 1947-1967. Komiyama, T. and Luo, L. (2007) Intrinsic control of precise dendritic targeting by an ensemble of transcription factors. Current Biology 17, 278-285. Komiyama, T., Sweeney, L.B., Schuldiner, O., Garcia, K.C. and Luo, L. (2007) Graded expression of Semaphorin-1a cell-autonomously directs dendritic targeting of olfactory projection neurons. Cell 128, 399-410. Komiyama, T. and Liqun Luo (2006) Development of wiring specificity of the olfactory system. Current Opinion in Neurobiology 16(1), 67-73. Komiyama, T., Carlson, J.R. and Luo, L. (2004) Olfactory receptor neuron axon targeting: Intrinsic transcriptional control and hierarchical interactions. Nature Neuroscience 7, 819-825. Dr. Komiyama was a Postdoc at Janelia Farm, Howard Hughes Medical Institute, received his Phd in Neurosciences at Stanford University (2006) and his BA in Biochemistry at University of Tokyo (2001). His Honors include: Helen Hay Whitney Foundation Postdoctoral Fellowship, Harold M. Weintraub Graduate Student Award, Japan-Stanford Association Graduate Fellowship, Stanford Graduate Fellowship, Pew Scholars Program, Packard Fellowship and Sloan Research Fellowship. Dr. Komiyama is a NYSCF-Robertson Investigator.